What’s Become of the Abu Dhabi Education Council (ADEC)? As you may know, I (Shon writing) got my start teaching overseas with the Abu Dhabi Education Council (ADEC) back in 2012. ADEC aimed to modernize the emirate of Abu Dhabi’s schools, and one way of doing that was bringing people like me to teach for them. Having quality teachers who were native English speakers was an important aspect of ADEC schools. After a bit of homework back when I was getting my resume ready to send off, I found that ADEC offered some of the best pay and benefits packages around, rivaling or surpassing even Saudi Arabia. Most teachers with a few years of experience and a Master’s degree could expect to make about $50,000 a year, tax-free, plus quality health and vision insurance, as well as yearly round-trip flights home for the spouse and two children. Housing was also included, meaning expenses were limited to utilities, phone and internet, and transportation. Plus, there was a bonus of one month’s pay for each year worked payable upon successful completion of a contract. If one was frugal, that regular salary could go a long way, and the bonus was definitely motivation to stick around and do a good job. Working for ADEC wasn’t a painless experience. There were many new and unfamiliar hassles to be negotiated, and that is easier said than done when you’re a foreigner dealing with bureacracy. As for how the actual classroom was, suffice it to say it was an ongoing challenge. Monetarily, though, the hassles were worth it. At the end of the month, ADEC always paid on time, and with the UAE Dirham pegged to the US dollar, there was never any worries about currency exchange rates fluctuating. The Emirates were also affordable–providing one didn’t feel a need to get caught up in the high-dollar lifestyle that the area is known for. Groceries were affordable, and everything we wanted was readily available. Except black beans. Those were in short supply. Gasoline was regulated to the equivalent of $1.70 a gallon, and the price never changed. Two years in, I fulfilled my contract and we decided to stick around for a third year, signing a contract for one more go ’round. After all, I was bringing home the same amount of money as Jenia and I had been when we’d both worked full time in the States. With all of my student loans now paid off, we could bank whatever we didn’t spend of my salary, plus the contract completion bonus would be even bigger. During my tenure with ADEC, there was very little notable change to the curriculum guidelines. I left in 2015 to work in Russia. There were no hitches upon leaving, and regarding salary, everything was paid as promised. We were even put up in a 4-star hotel as we emptied our apartment and had utilities disconnected. In all, we left feeling good about our time in the United Arab Emirates. So what has become of ADEC since 2015? The short answer is that in 2016 ADEC was incorporated into the Ministry of Education. Now there is a Department of Education and Knowledge, which still utilizes language from the Abu Dhabi Education Council’s program. There have been sweeping changes to curriculum. Judging from what my colleagues there report, they’ve been positive ones. Insofar as working for the new version of ADEC (now abbreviated ADEK), this transitional year has seen little change to employment contracts, but there has been a reduction in insurance benefits. Now they’re limited to the emirate of Abu Dhabi. There is rumor of big changes with next year’s contracts, but those are just rumors. One must never put too much stock in those. Thus it seems that ADEK is mostly status quo, at least for now, in terms of the employment bottom line. However the cost of living has risen greatly, and that must be a factor in any decision about working abroad. From time to time I entertain the idea of going back to the UAE. Working for ADEC was quite an experience, and one which was beneficial in many ways, and the UAE is an endlessly fascinating place. Regardless, even from a distance, it will be interesting to see how this new iteration of ADEC turns out. Here’s hoping it is a great success for all involved. 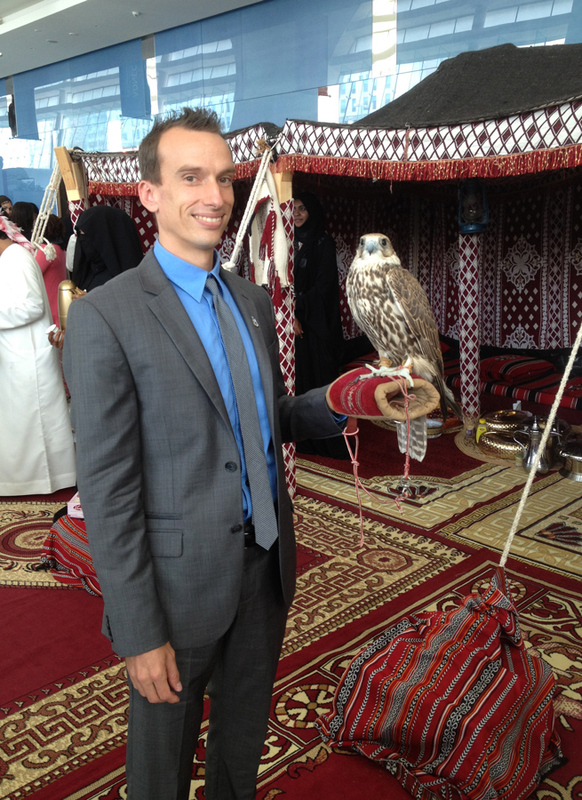 I got to hold a falcon!